49 days. Cucurbita pepo. (F1) Plant produces good yields of small 4" to 6" long baby zucchini squash. This is a true baby squash that are glossy medium dark green with stripes. Excellent choice for home gardens. A summer squash variety. Limited quantity available. Item will be discontinued once inventory is depleted. Winter Squash need warm weather to grow. It is best to plant seeds directly in the garden. Plant your seeds after the soil has warmed up. Thin so there are 4 plants per hill. Eight to 10 plants will provide more than enough for a large family. You can trellis squash to save space. Plants grow 2 ft tall and vines spread up to 10 ft. Protect ripening winter squash from damp ground by placing them on boards. 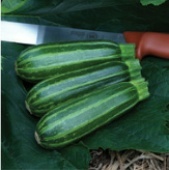 Cut winter squash carefully from plants to prevent damaging the vines.